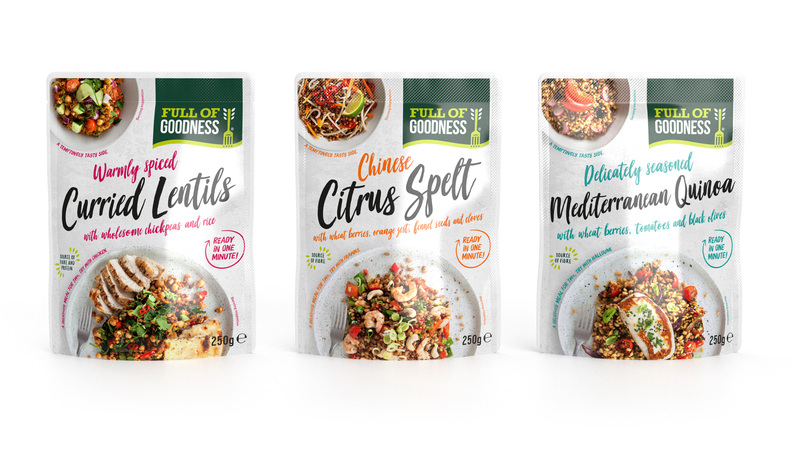 Full of Goodness is a new brand to the shelves of our supermarkets. Is it a one minute wonder? Well yes if we can be glib and mention it only takes a brief one minute spin in the microwave before it’s ready to enjoy. And no – absolutely not. The popularity of Quinoa has driven phenomenal growth, with Europe seeing an increase in consumption of over 300% between 2012 and 2016. 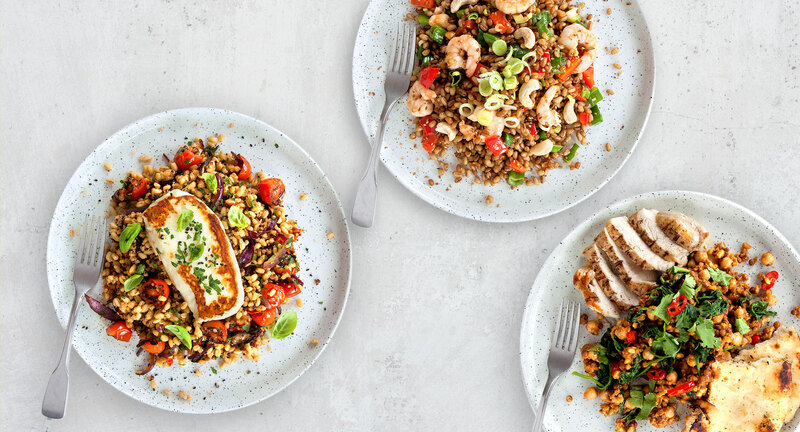 With many consumers still not aware of the seed, let alone the health and ecological benefits or even how to pronounce it, all evidence suggests Quinoa is still near the bottom of its popularity curve. But it’s not all about the 4000 year old superfood. Quinoa’s popularity has helped bring all manner of ancient grains back into our recipes and consciousness. And Full of Goodness is bringing them back to our plates, quickly and easily. For Full of Goodness to succeed however our mission was to promote the benefits to customers arriving at the aisle for the first time. By amplifying tastiness instead of looking overtly healthy, the pouches scream to be tasted. And by promoting versatility, supported by a competitive price point we hope to bring new fans to the category. We decided to show two serving suggestions on the front of pack, something you don’t see very often. Doing it this way quickly demonstrated a couple of simple options of how you could enjoy the product. 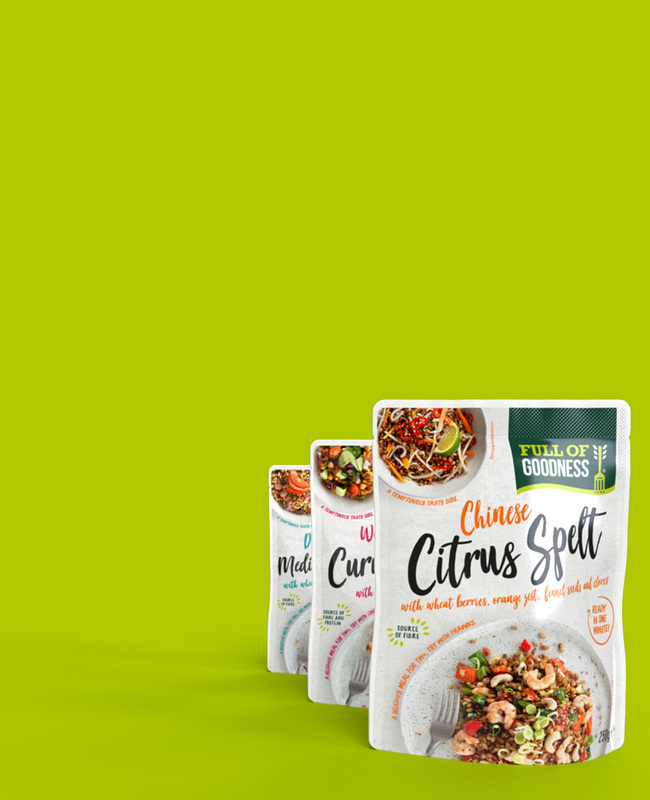 Unlike some of Full of Goodness’s competitors, our grains and seeds are already combined with other tasty ingredients so you have the simple third option of serving it straight from the pack. Quinoa is a complete protein. It is the only grain or seed that contains all 8 essential amino acids. Lentils, Spelt, Quinoa, Chickpeas, Wheatberries, Freekah and much of the category pander to committed healthy eaters and foodies. Full of Goodness talks honestly and directly to the ‘not so sure’, but would ‘like to try’ shoppers. We think there is a fantastic opportunity for these tasty, convenient, healthy and affordable sources of nutrition to become part of our everyday menu.